Before we discuss why digital transformation is important and how businesses are leveraging digital business transformation using outsourced nearshoring, we must first define digital transformation. Simply put, it’s the process of implementing or rebuilding the technology, systems, and processes of a business in order to better serve current and future business objectives and revenue streams. Digital Competitors In almost every industry, long-established business models are not only failing to live up to to the digital business transformations of their competitors but also are losing ground to new start-ups and disruptive “born digital” models in their industries. For example, restaurants such as TGI Fridays and IHOP are losing market share to newer, more disruptive restaurants that are using digital transformation to innovate in the space – using Google Assistant and Amazon Alexa to offer new ways to order food and to engage with their restaurants. Customer Expectations A customer’s voice is louder than ever, and one bad experience can have a ripple effect that can damage your bottom line for years to come. With more choices than ever and greater accessibility to more markets, it is essential to constantly improve the customer experience through digital transformation. The customer experience must be flawless at all touch points with your business. Maintaining that level of service is a constant pursuit. Employee Productivity A digital transformation doesn’t necessarily involve turning all of your infrastructure over to robots and digitization; it’s equally important to empower your employees and teach them how the new tools and systems can help them achieve better results and increase their productivity. For example, the HR department can benefit from a digital transformation through an improved payroll process. This would enable them to focus their attention on more important business tasks. Cyber Security Digital transformation can only be as transformative as the safety and security that protects it. This task is extremely important but equally as difficult. An ever-evolving security strategy must be implemented across all data, applications, and networks. Confidence in a strong security system allows the company to focus on achieving business goals, while innovating in other areas of the business. Sophisticated Expertise: Nearshore outsourcing can bridge the gap between parts of a digital transformation that a business is not knowledgeable or competent in. Outsourcing various parts of the process can free up time and energy that the business can invest in other critical objectives. For example, a food distribution company can outsource the digital transformation of its supply chain management so it may focus on onboarding new employees. Digital Insights: Consulting a third party expert with digital transformation experience can also lead to new and innovative ways to improving your business – helping you to find more efficiencies along the way. For example, the nearshore outsourcing company hired to help with the digitization of your supply chain system may also uncover a more efficient way to handle payroll. Faster Time-To-Market: Similarly, partnering with a nearshore outsourcing expert means trusting an expert in the space. With this comes efficiencies and results that a company’s internal team and process simply couldn’t compete with. Therefore, it can provide a leg up on competition that may also be in the midst of a digital business transformation. 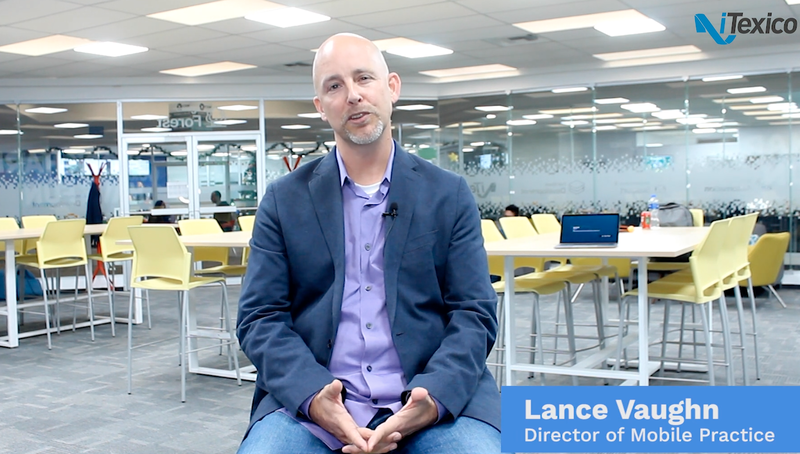 Strategic Partnerships: Outsourcing parts of the digital transformation process is an effective way to succeed, for the reasons outlined above. However, because these solution providers usually have experience in all disciplines, some businesses opt for more of a strategic partnership with these providers in a bid to have help in handling all of the company’s technological gaps. This can be very effective in establishing a consistent and thorough transformation. With a high degree of importance placed on the digital transformation of businesses in all industries, it is no wonder why many choose to pursue nearshore outsourcing as a way to alleviate the time, stress, and expertise required to be successful. 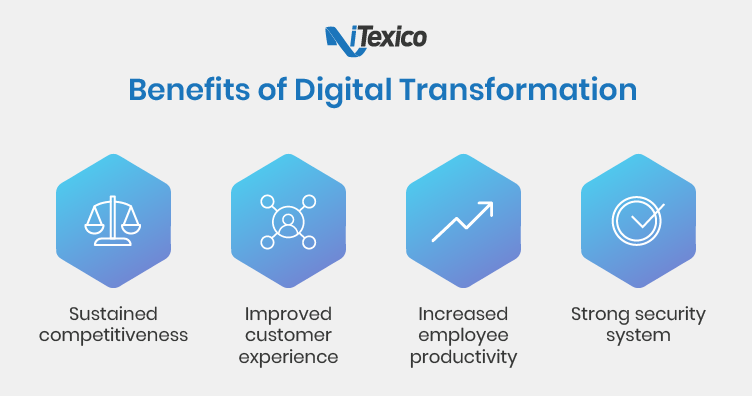 Staying competitive, keeping customers and employees happy, and protecting your business are only some of the reasons why a digital business transformation is so essential to success. A business that looks outside of its internal resources and works with a nearshore outsourcing firm to transform will find the process to be vastly more efficient. If you are ready to trust an expert to help you compete and succeed in your industry for years to come, to learn about iTexico and its Nearshore Plus services.